I started beekeeping to sustainably support my work with encaustic painting—an art form based in wax. While doing so, I learned about the importance of bees for our sustainability. I also learned about honey’s nurturing and healing properties. It compelled me to make Bee Inspired health and beauty goods. Thus Waxing Kara was born, from a core value to honor and celebrate the critical role that bees play in our lives. Maryland’s scenic Eastern Shore offers the ultimate setting for Waxing Kara’s operations. It hearkens back to simpler times, providing a perfect balance of healthy and balanced living with the Chesapeake Bay and its brilliant wildlife, plants, and wildflowers, bright mornings, and relaxing evenings. Our farm hosts bees and a cornucopia of wildflowers, plants, shrubs, and trees that specifically help the bees to thrive—including thyme, bergamot, daisies, camellias, hydrangeas, blueberries, and apple trees. We do our best to bring a sampling of all of these treasures into our products. Our skin, the body’s largest organ, is capable of absorbing up to 60 percent of the ingredients that we apply to it. We believe that what we put into and onto our bodies directly affects how we feel and interact in our surroundings, and that nature holds the key to our well-being. That’s why, at Waxing Kara, we keep our ingredient list as close to the earth as possible. 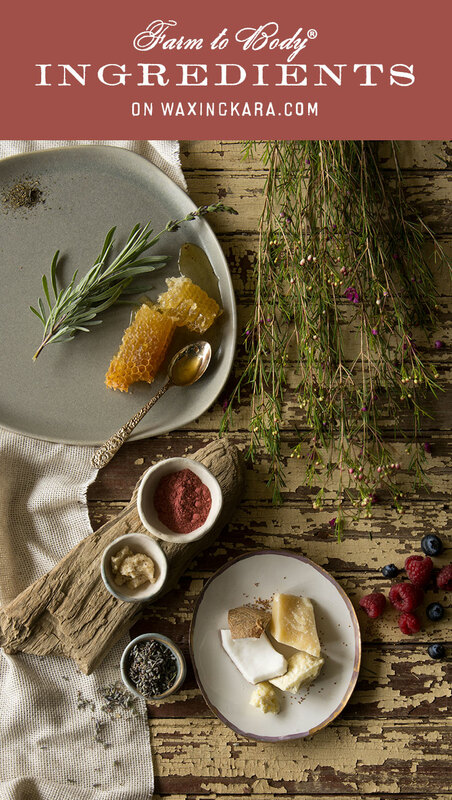 We focus on natural ingredients that depend on bees for pollination and provide bees with sustenance. Some of our products aim to help you battle breakouts or soothe irritation, and all are designed to nourish and regenerate. We team up with seasoned, experienced craftspeople to create our beautiful and functional offerings by hand, from scratch. No pre-bought base creams. No unnecessary chemicals, fillers, parabens, or additives. We focus on plant-based formulations and use organic ingredients (USDA certified organic whenever possible)—or a mix of natural and organic ingredients—in every Waxing Kara product. We keep it basic and simple. You’ll get a true flavor of Farm to Body Ingredients from the Eastern Shore. Bee inspired® Inside & Out. We aspire to nourish your mind, body, and spirit by bringing nature into your everyday life, inspiring natural beauty—the kind that comes from within. In addition to having culinary uses, almond oil is the most popular oil used in skin and hair care. Pressed from dried almonds, it is rich in vitamin E and phytosterols, antioxidants that help protect and soothe skin. We use sweet almond oil, from edible almonds selectively cultivated for their sweet taste, in some of our scrubs and butters. Used in ancient Egypt 6,000 years ago, aloe vera was known as the “plant of immortality,” given to Pharaohs at their burial. The gel is taken from the inner leaves of the aloe plant—a semi-tropical succulent. It is used topically to soothe skin, especially when it’s been sunburned or scraped. We use aloe vera in our Sweet Lips Honey Lip Balm. Avocado oil is extracted from the avocado pulp. Rich in vitamins A, D, and E, it’s a good additive to skin care products, especially those for dry and maturing skin. We use unrefined avocado oil because it contains higher amounts of nourishing vitamins and solids and has an exceptional moisturizing capability in our facial oil. Its green color livens up our products! Bath salts are naturally occurring minerals—such as potassium, calcium, magnesium, and zinc—that have been pulverized. The practice of bathing with salts to relax and detoxify goes back centuries. Various bath salts have differing mineral compositions, and sometimes additives, and are often named for the areas in which they were discovered. Epsom Salt (magnesium sulfate) refers to an English town and contributes to our especially enjoyable foot soak. Dead Sea Salts contain high amounts of magnesium and other minerals that are easily absorbed through the skin. Fossilized Sea Salts, formed when water evaporates, are harvested from various locations around the world. We use only bath salts without additives in our Peace Soak and in our Spa Pediscrub. Beeswax, a natural thickening agent, is produced by worker bees, and with it they construct their honeycomb. We use beeswax—taken from the hives—in our creams and lotions to help emulsify oil and water so they don’t separate out in the finished products. Beeswax also moisturizes and protects skin, and is found in nearly every Waxing Kara product. Berries are rich in antioxidants, such as phytochemicals, bioflavonoids, and vitamin C, which inhibit free radicals that can damage skin cells. We use nature’s fruits—blueberry seeds and oils, cranberry seeds, blackberries, strawberries, and raspberries—rather than man-made chemicals in our products to calm and soothe skin. Their lush colors and scents brighten our day. Buttermilk, nature’s food for newborn mammals, is full of proteins and fat. In addition to having nutritional value, it is useful in skin care. Cleopatra, the ancient Egyptian queen, apparently attributed her smooth and radiant complexion to milk baths. We use buttermilk in our Clarity Mask. We use citrus for its high vitamin C content. Vitamin C plays a role in skin health by aiding in collagen synthesis, which is essential for firmness and smoothness. When applied topically, it can also help with skin brightening and acne. Our Good Fortune line contains essential oil of grapefruit, and our Lip Scrub line contains distilled lemon oil. You can mix our dry masks with orange juice to help balance oily skin. Clay forms over time as rocks—which are made out of minerals—weather and decompose. Applied to the skin while wet, it binds with, draws out, and removes impurities as it dries, leaving the skin clean, toned and smooth. Clays are distinguished by their composition, color, and key uses, and each plays a different role in skin care. Kaolin, or white clay, is one of the lightest and thus least drawing of the clays. It is suitable for sensitive, dry, and mature skin. Red clay contains high amounts of silica and iron and has good drawing action. Pink clay is created by mixing white and red clays; while it is gentler than red clay, it is not recommended for sensitive skin. Rhassoul clay, which comes from the Atlas Mountains in northern Africa, is high in silica and magnesium, and is known for its astringent, detoxifying, and cleansing properties. Sea clay is rich in algae, sodium, and sulfur, and is known for having beneficial properties, as well as oligo-elements such as copper, selenium, and zinc, which are important to the immune system. It is effective while being gentle on the skin. Bentonite clay, from volcanic ash, is best known for its use in gentle detoxification. It draws impurities from the skin and body without being too disruptive. We use food-grade bentonite clay in our dry masks and soap. We use different types of clays in our various dry masks and in some of our scrubs and soaps. Cocoa butter comes from the cacao tree, which originated in Central America and Mexico. Extracted from roasted fermented cacao beans, cocoa butter is a rich, creamy fat and the main ingredient in chocolate. It stays solid at room temperature, but melts to the touch, so it’s great in creams that glide onto skin. Rich, moisturizing, and emollient, It is an excellent, stable ingredient that combines well in formulations, and is a source of natural antioxidants in our scrubs, creams, lotions, and soaps. After cocoa butter is extracted from roasted fermented cacao beans, the remaining solids are ground up to make cocoa powder. A source of antioxidants and minerals, cocoa powder is used in our Haute Cocoa® line to help with skin renewal and elasticity. We use only organic cocoa powder that has not undergone Dutch processing (a chemical process that alkalizes the cocoa and reduces the amount of antioxidant flavonoids) because we wanted the best product for your face and body. Coconut milk is made by soaking the white, fleshy part of the coconut, skimming off the cream that rises to the top, and straining and capturing the liquid. Smooth, and rich in copper and vitamins A and C, it is used to combat tired skin with deep moisture, improve skin elasticity and texture, and promote healthy, radiant skin. Coconut milk is in our Mask line. Coconut oil, derived from the white fleshy meat of the coconut, is useful not only in cooking, but also in cosmetics. High in vitamin E, saturated fats, and other fatty acids, it has skin-soothing and nourishing properties. For our creams and butters, we use coconut oil that is solid at room temperature, making for a rich product. Fractionated coconut oil, in which the solids have been removed, are used in our scrubs for its wonderful glide. Virgin coconut oil adds a delicious scent to some of our formulations. We use coffee—made from the beans of a bee-friendly plant—in our Grounded line for the antioxidant and anti-inflammatory benefits that caffeine has on skin. Caffeine’s vasoconstrictive qualities, temporarily shrinking blood vessels, reduce redness and swelling of the skin, alleviating puffiness and other aesthetic unpleasantries. Plants produce aromas to attract pollinators, and essential oils capture these natural fragrances through distillation. In this process, the plant’s aromatic vapors are released, condensed, and cooled into concentrated liquid form. Essential oils may be used to aid physical and emotional well-being. Some, such as lavender, are relaxing. while others, like citrus, are invigorating. We use essential oils rather than manmade fragrances in all of our body products because we think they are better for you. We choose ones that are good for skin and tend to elicit a positive uplifting of the spirit. We also use essential oils that are safe to burn in our specially-formulated Spa candles. Fragrance oils are a mixture of synthetically manufactured chemicals that imitate the scent of aromatic plants. Small amounts of plant oils may be added to the mixture to enhance the scent. Fragrance oils are used in cosmetics to provide a consistent scent in products—something that essential oils cannot do because plants change their properties over time; no two batches will ever smell exactly alike. We use phthalate-free fragrance oils in our candles—they are safer to burn than typical fragrance oils, and they are safer to burn than many essential oils. They provide the beautiful scents that our customers have come to love. Gingerols, the oily resin of the ginger root, have potent antioxidant and anti-inflammatory properties. When topically applied, ginger can inhibit free radicals that cause skin damage and aging. It is also used to reduce the appearance of hypopigmented skin (which is light or white from loss of skin coloring, mostly caused by injury), even skin tone, and improve elasticity. We use green tea—teas leaves that been carefully dried as not to oxidize—for its strong antioxidant properties. Antioxidants help combat ultraviolet radiation (UV) damage, detoxify the skin, and reduce inflammation. It is also rich in nutrients, including polyphenols and vitamins C and E. Because it’s great for sensitive skin, we use green tea in our Good Fortune line and Sea+Tea Mask. Extracted by cold-pressing hemp seeds, hemp seed oil is high in essential fatty acids, omega oils, and antioxidants. (It has none of the psychoactive components or properties associated with the hemp plant flower.) It’s a superb additive for hair and skin care products. You can find it in our Sweet Lips Honey Lip Balm. Approximately two million flowers must be visited by worker bees to yield one pound of honey. Rich in many essential nutrients, including vitamins C, D and E, honey is a natural humectant that draws moisture to the skin. It also serves as a natural antibacterial, speeding up healing. (Did you know that the University of Maryland Medical Center references honey as a treatment option in wound care?) We include honey in nearly every Waxing Kara product. Jojoba is a liquid wax that looks and acts like oil. Made from the bean of the jojoba plant, which is native to the Southwestern United States and Mexico, it’s been long used by Native Americans to treat skin problems and wounds. Jojoba is very similar to sebum, our skin’s naturally produced moisturizer, and therefore works effectively as an emollient. We’re pleased to have teamed up with a farmer who provides us with organic jojoba. We use it in our facial oil, baby oil, and body oil, and it is in a couple of our scrubs. Harvested from the nutrient-rich sea, kelp is a seaweed that is part of the brown algae family. Rich in minerals such as iodine, and antioxidants, it is used to nourish, moisturize, and soften the skin and help it retain moisture. Kelp also contains elements that can easily penetrate the skin to remove toxins. Its anti-inflammatory properties can soothe inflammation that causes red, painful breakouts. We use kelp in our Sea+Tea Mask, and Sea+Tea Scrub. Lavender is an aromatic herb native to the Mediterranean region. Its fragrant oil, which comes from the plant’s blue violet flowers, has long been used to soothe and relax. We use lavender as a natural antiseptic as well as to soothe skin irritations and promote relaxation. You can find it in our entire Peace of Mind line, our Calming Mask, and our Honey Lollipops with crushed lavender. Olive oil extracted from the fruit of olive trees, has been used for thousands of years for cooking, medicines, soap, cosmetics, anointing bodies, and light. In his epic poem, The Odyssey, Homer called olive oil “liquid gold.” Rich in antioxidants—vitamin E and phytosterols—it helps protect the skin from premature aging. We use olive oil in all of our cold process soaps and our Spa Candle line. Polysorbate 20 is a surfactant, emulsifier and rinsing agent that helps mix oil and water in cosmetic creams, lotions, and scrubs. We use it in small amounts to help with incorporating essential oils into our scrubs and to also assists in rinsing off fatty oils that land on your skin when using a handful of our scrubs. It leaves you with just enough moisture—not too much or too little. Your skin is left feeling soft, smooth, and moisturized. Pumpkin, a type of squash, is rich in vitamins and minerals, and is a find for skin care. Alpha hydroxy acids (AHAs) eat away at dead skin cells, revealing fresher and brighter skin. Vitamins A and C, which are antioxidants, assist in collagen production and softening and soothing skin. We use pumpkin in our Harvest line. Pumpkin seed oil, made from crushed, roasted pumpkin seeds, is rich in omega-3 and -6 fatty acids as well as in vitamins A and E and other antioxidants. It offers moisture-retaining benefits for the skin and fights free radicals, helping to maintain a youthful appearance. We use it in our Harvest Scrub. Extracted from the nuts of the African shea tree—whose name was Anglicized from one of its African names—shea butter is soft and creamy. High in vitamin A and fatty acids, it melts and absorbs easily, nourishing the skin and helping to prevent moisture loss. Our scrub and butter products contain shea butter. We source both unrefined and refined organic Shea Butter that is also Fair Trade. Soap recipes were found on cuneiform tablets dating back over 4500 years, to the ancient Sumerians. By the seventh century, soapmaking was recognized as a craft. While ancient soaps were made with volcanic or plant ash—which acted as an alkali (or neutralizer)—today’s soaps use man-made alkalis. Sodium hydroxide, commonly known as caustic soda or lye, is the necessary alkali for bar soaps. It is added to water and oils and goes through a chemical reaction process called “saponification,” after which absolutely no lye remains in the finished product. We use 100% sodium hydroxide beads when creating our soaps. The beauty of handmade soap is that its oils draw away impurities, cleaning the skin without hurting it, and its naturally produced glycerin moisturizes the skin. Stearic acid is a fatty acid used to thicken and add texture and form to health and beauty products. It is similar in texture to wax, and adds a pearlescent quality to creams and lotions. We use stearic acid that is only derived from vegetable sources in a handful of our body scrubs. Sugar is used for more than baking and sweetening hot beverages. It is an excellent exfoliator that sloughs off dead skin cells and allows new ones to surface. That’s why organic sugar is in all of our body scrubs. It works best on the hands and elbows, knees, ankles, feet, and heels. It may be too abrasive for softer areas, such as the face and neck, so while our scrubs smell divine, keep that sweetness away from your mouth! Sunflower oil, derived from the sunflower seed, is light and easily absorbed into the skin, offering intense hydration without leaving behind a sticky or waxy coating. We love that USDA Certified organic sunflower oil is readily available on the market. You’ll find it most of our scrubs and butters. Oil and water do mix! We hand mix oil and water with great vigor, initiating a chemical reaction that yields an emulsion commonly known as body butter. What other companies make their creams by hand? We sure love what we do! We use natural vegetable oils that are light and easily absorbed into the skin while also offering intense hydration. Skin needs oil when it dries out—even oily skin. If you use oil to cleanse and moisturize, you will see results over a short period of time. A naturally derived ingredient with antioxidant properties, vitamin E oil is used to reduce skin inflammation or irritation. It is also used as an antioxidant in just about every single product including lip balm and massage oil. We use soy-free, non-GMO vitamin E oil. Bees are critical to sustaining walnut trees. We use finely ground walnut shells as a natural exfoliating agent. They help rid the skin of dead cells and allow new, rejuvenated skin to surface. Walnut shells are found in our Harvest line and in our Lip Scrubs.